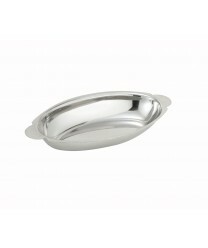 Elegant and made of durable, mirror polished stainless steel, the Winco ADO-12 Stainless Steel Oval Au Gratin Dish 12 oz is perfect for serving your au gratin dishes. Be it filet of sole au gratin, potatoes au gratin or broccoli au gratin, the trick to a perfect au gratin is the crusty top. The Winco au gratin dish has just the right depth and shape to enable you to top off your au gratinjust right and serve it to your guests in this beautiful serving dish. The integrated handles will enable your servers to easily place it to on the table for your guests to enjoy.